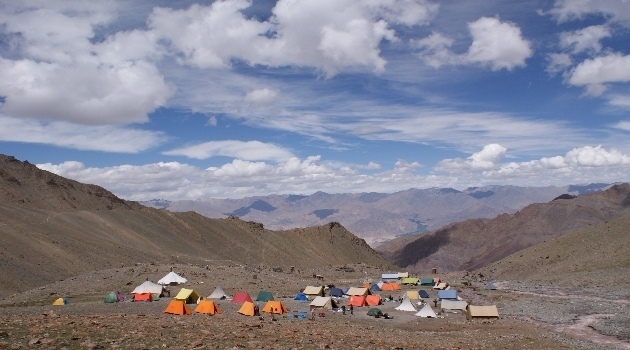 The Stok La Trek is one of the very popular short treks in the leh / Ladakh region. While on the Stok La trek, trekkers go through the scenic valleys and pass through many traditional Ladakhi villages, and Buddhist monasteries. The trek takes you to Stok La, at an altitude of almost 4900 mtrs above sea level, from where there are excellent panoramic views of the Ladakh Himalayas, including the popular Stok Kangri Peak, which is at an altitude of over 6000 mtrs, and which is a very popular trekking peak in the Leh Ladakh region. The trek also gives you a chance to visit the Stok Palace, the former residence of the Ladakh royalty. On the way one might see Snow Leopard signs along the valley bottom of the side valleys if you are trekking during winter or early spring/fall. The trek follows the Indus river down stream through a stunning rocky gorge. Rumbuk village which is meant to be the best place in the world to spot snow leopard a rare sighting as well very rare blue sheep (half sheep half goat). Just like being in a national geographic film with camping at the base of Stok Kangri Mountain rearing up at 6000 meters plus, all covered in snow. A very cold and tough night to be spent at high altitude Surrounded by prayer flags and stunning views as exploring the Hemis National Park. 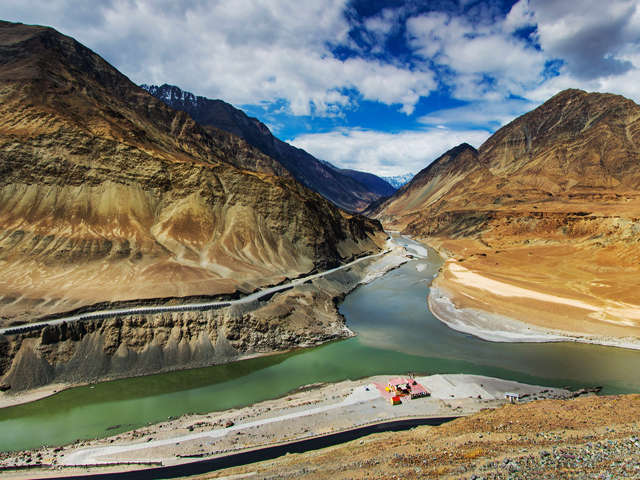 Most trekkers undertaking a trek out of Indus Valley spend some time in Leh, the capital of Ladakh before heading off on a trail. You can fly in into Leh or arrive by road. 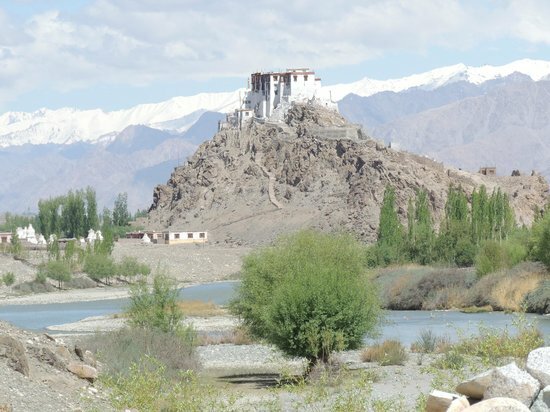 It is recommended to spend a couple of days for acclimatization in Leh as the town is at around 3500 meters altitude. There are lots of places to shop, eat out and sight seeing near Leh. You can visit Leh market, monasteries or visit the beautiful Leh Palace. We will make an early start as there will be no shade on the way and the water is scarce. We reach Spitok and start our trail. We will visit the Spitok Monastery/Gompa following a dirt trek along the bank of river Indus. After a few kilometers there will be beautiful views down Indus valley across Phe village. Further down 7 kilometers and we will reach confluence of Indus and Zinchen River. We cross a road bridge and walk along willow trees alongside the river until we reach Zingchen. We will camp here tonight. It's a short and interesting trek today as we walk up over an impressive gorge with tantalizing views of snow capped peaks beyond Rumbak. It's also a necessary stop over before acclimatization for Stok La Pass. From Zinchen we will cross the stream and continue towards left of the gorge alongside river. In the meanwhile we will be crossing a rickety old wooden bridge. We will be crossing the river stream again on our feet. There will be some boulder hopping this time and then the trail leads us towards a confluence of Zinchen River and a water stream. We will be crossing another wooden bridge before we reach a place with Buddhist prayer flags and then we reach another bridge and push our final ascent to fields of Rumbak village facing snow capped ridges on the Stok Range. There is a small eatery (Dhabha) and our campsite at 3850 meters. Here one path leads towards Markha Valley Trek however we will take the side trek towards Rumbak Village (4000 meters). Here are some houses amid fields of Barley and Mustard and prayer flags. We camp here tonight while enjoying the weather and beautiful scenery and explore Hemis National Park. Today is another short but rewarding stage following a well defined trek leading from Rumbak to base of Stoke Pass. The route takes us across views that are spread towards scant grazing land and high windy ridges. As we trail ahead the location of the Stok La becomes more visible. The trail gradually ascends and while leading us through scant vegetation takes us to the base of Stok La (4400 meters). From here the ridge of Stok La is visible, and with good eyesight we can even see the flags on top of the ridge on a clear day. The views are amazing back down the valley across to the elevated grazing pastures and the impressive ridges. We camp tonite. The ascent to the Stok La is rewarded with panoromic views that extend north the snow-capped Ladakh range and to the distant peaks that form the East Karakoram. When we reach the pass we will be rewarded with magnificent bird eye view down the Indus Valley and the settlements 1300 meter below. The climb to the pass is steep and we have to take baby steps to avoid getting tired along with deep breaths. Stok La is a double pass, after crossing one pass there will another pass in 10-15 minutes of reach. From second pass there are views down the Doksar which means a high grazing area where villagers from Stok tend to their sheeps and goats in summers. There is a steep descend towards Doksar which usually takes an hour or a little longer. Here there is a spring line and wild flowers and beautiful campsides, however we will head down further alongside the gorge to reach Changma (4100 meters). There is a small dhabha (eatery) here and this site is frequented used by groups ascending for Stok Kangri Base Camp. We will camp here tonight. This is a short trek that allows us to visit the beautiful Stok Palace before continuing to Leh. The trail continues downhill alongside the left bank of the river stream. We will be greeted with wide variety of Willows and Wild roses growing in shape of islands in the river stream which grow quite wide as we approach Stok. There are beautiful views in the backdrop of the Ladakh Range and number of eateries on the way. We will reach Stok Palace Museum after another 30 minutes walk from here. The Stok Palace was built in 1836 after the King of Ladakh was exiled from Leh by the Dogra Army led by general Zorawar Singh. There is a well maintained museum inside the palace which displays the royal heritage of the family,ancient war implements as well as a stuffed snow leopard. Here our jeeps will be waiting to transport you to your hotel in Leh which is 13 kilometers from here.